The world's best-selling laser printer just got better. Introducing the HP LaserJet 4050 printer, the new replacement for the best-in-class HP LaserJet 4000 Series printers. Offering increased printing performance, increased printer versatility, and lower total cost of ownership. 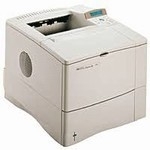 This 17 PPM black and white printer is perfect for small to medium size workgroups. Paper Sizes: Letter, legal, executive, Custom: 3" x 5" to 8.5" x 14"